During the past three weeks we have been carefully excavating the intricate archaeological deposits in Trench 6, Bone Passage, and have uncovered the natural limestone bedrock floor in the east half of the trench. The deposits, removed in one metre grid squares, have produced a wide range of finds and display some unusual modes of deposition. The full depth of material removed from this half of the trench exceeds 1.2 metres and we have identified several distinct contexts, which we hope to clarify further using C14 dating. 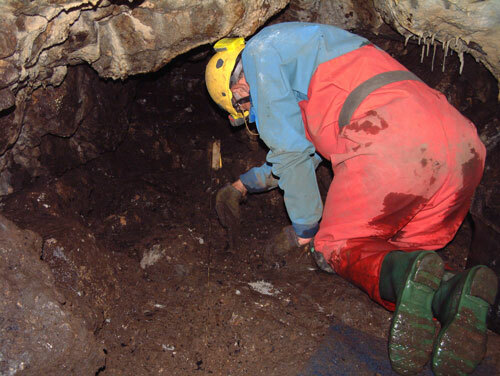 The image above shows Martin excavating in Bone Passage during the end of the 2005 feildwork season, while the image below was taken two weeks ago during the removal of deposits in Trench 6. The deposits removed from Bone Passage are 100% wet-sieved and it is during this process that most of the artefacts and ecofacts are collected. After drying in air, the remaining residues are sampled and sorted for smaller material such as fish bone, charred grain and burnt hazelnut shell. 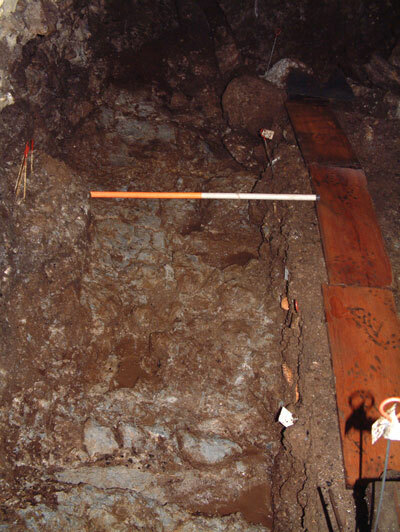 During the excavation of Trench 6 we have recognised complex modes of deposition within Bone Passage, both laterally and vertically, in relation to the stairwell entrance and to the varied height of the passage roof. As would be expected, the highest section of the passage has been used for the main route of access through the cave. This is displayed by stone settings and small paving slabs within some contexts of the deposits, while the archaeological deposits are also more compacted through the passage of feet. To either side of the main access route through the passage the deposits vary considrably, both in their morphology and in the material they contain. For example, some areas comprise the deposition of significant quantities of fire-cracked stone and burnt bone, while others contain large quantities of semi-articulated animal bone. Although the bone displays butchery marks and evidence of processing to extract marrow, material relating to individual animals such as cattle, pig and sheep can still be recognised. And, although we have recovered a significant amount of artefacts from the area where the man-made stairwell meets the natural cave, small finds have also been found down the length of the trench. Individual items such as a soapstone disc (spindle whorl? ), bone pins and stone tools have been recovered in isolation, but we have also uncovered cache’s of small finds. 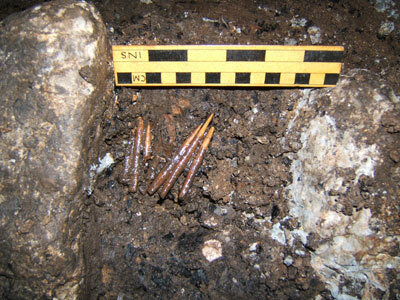 In a recent update in the Latest Finds section, we showed a digital image of a cache of antler pins recovered from a step at the base of the stairwell, while recently we have uncovered a second cache of pins that had been placed between two paving slabs running down the centre of the passage. The position of the pins in such a tight cluster suggests they may have been bound together before deposition within Bone Passage. What is also quite curious is that all seven pins appear to have been utilised in a similar function, possibly in the manipulation and manufacture of thread or fabric. We recovered two identical items during excavations in Bone Passage in 2004. Further images and information relating to these finds will be available on the Latest Finds page soon. 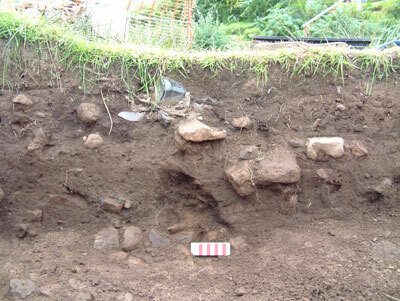 The excavations undertaken at the High Pasture’s site so far show a definate concentration of small finds within Bone Passage and in the area immediately outside the cave entrance, indicating that this was indeed a special place within the prehistoric landscape of Skye. Work has also continued on the surface trenches at the High Pasture’s site, especially in Trenches 9 (burnt mound) and 10 (roundhouse structure). We have now reached the natural karstic clay layer in Trench 9 and have revealed a considerable depth of fire-cracked stone deposit within this area of the site. The burnt mound/spread is between 0.3 and 0.7 metres in depth, within which we have uncovered a low revetment wall of granite boulders. 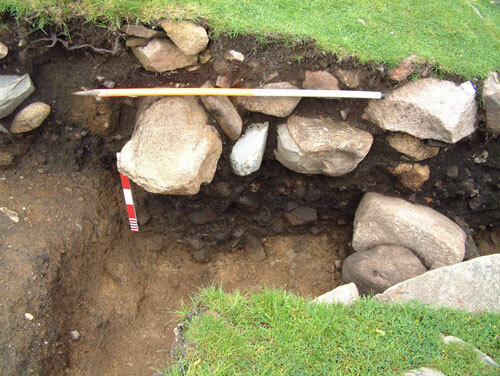 Although this feature will be subject to further investigations this year, it is possible that the revetment wall was originally constructed to contain the original burnt mound material. If this was indeed the case, then the excess material has run over the wall downslope and here it has reached its maximum depth. Few finds have been recovered from the burnt mound material with the exception of burnt bone, charcoal, iron slag and a few degraded sherds of pottery. However, within the ditch or pit feature we did recover more unburnt bone and charcoal lumps, between some heavily burnt granite cobbles. Two new trenches will be opened in this area of the site this year to investigate the extent and morphology of the burnt mound/spread and any associated structures. 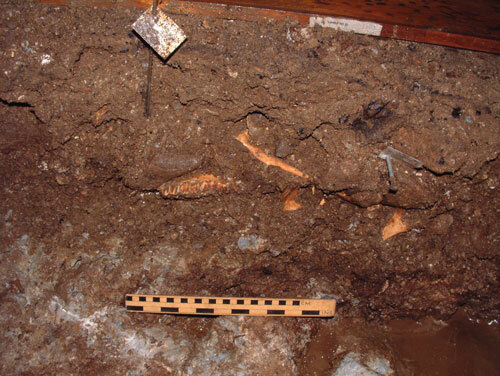 There is no doubt that the material forming the burnt mound/spread relates to activities involving fire that have taken place on site, whether these are connected to cooking animals, the cremation of animals and humans, or with metalworking. 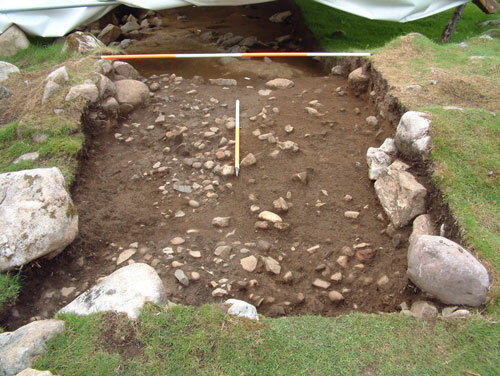 Hopefully, further excavation and analysis of the resulting materials will enable more informed interpretations to be made regarding site function and the activities taking place at High Pasture’s. Finally, we have now finished the excavation of Trench 7 within the ‘roundhouse’ structure and have extended the trench (Trench 10) to investigate any potential in-situ wall structure. Excavations within Trench 7 revealed no evidence of occupation floors and very few finds, although we did uncover several post and stake-holes - some of the post-holes containing packing stones and the remains of burnt wooden posts. It would appear that the circular structure was not a domestic dwelling, unless the occupation floors and any material they contained were completely excavated away in the past and deposited elsewhere. 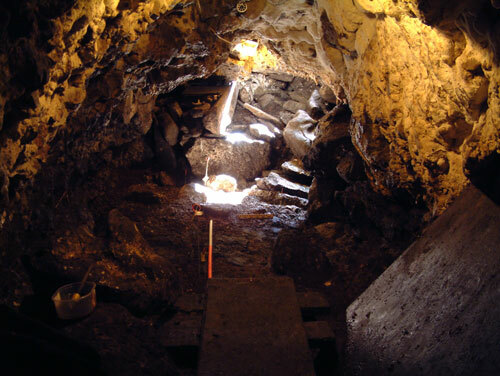 From our excavations so far it is possible that the interior of the structure has been modified, with the removal of primary archaeological deposits and their replacement with homogenous, brown sediments. 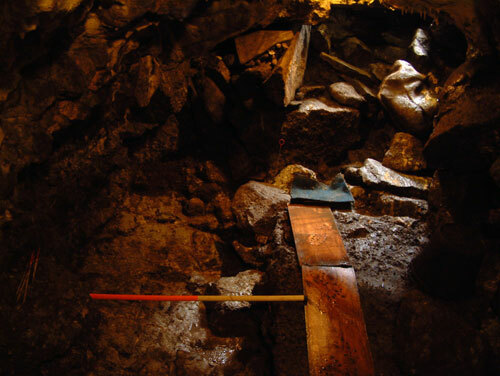 No evidence for the post-holes was found in any of the contexts above and the ‘wall’ of the structure is ephemeral in nature, comprising a spread of stones and sediment. Excavation of Trench 10 has so far clarified this hypothesis. 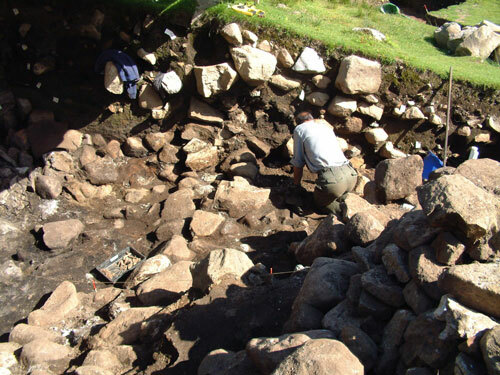 The excavation has revealed no in-situ wall or structure, but has exposed a dense layer/spread of fire-cracked pebbles and stone. This may be a continuation of a wider spread of fire-cracked stone material that has been identified in the southern baulk of Trench 7, which post-dates the post and stake-holes and other features in the trench, but pre-dates the formation of the stone and sediment circular mound, originally proposed to be the roundhouse. Now that the surface above has been recorded, we will continue to section the trench and remove the fire-cracked material. 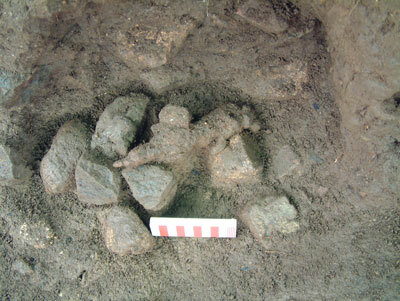 It will be interesting to see if we uncover further post-holes and features relating to those identified in Trench 7. Visit the website again soon.